hoppers with extensions and can hold up to 10,000 coins with a diameter of up to 24mm. It is the ideal solution for dispensing large quantities of two different coin/token denominations guaranteeing maximum collections safety. 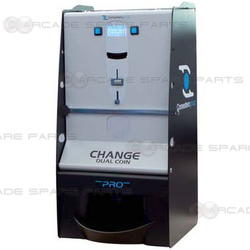 Its exceptional structural strength, reinforced closing mechanisms, new anti-theft and split-hypenated protection devices, and the ccTalk protocol make Dual Coin PRO one of the most secure change machines on the market. The new 32-bit CPU provides notable functions such as importing/exporting configuration parameters, exporting accounting data and the useful function of machine cloning. Dual Coin PRO can be equipped with the Smiley NV9 banknote reader with built-in stacker to stack up to 600 banknotes.